Did you sign up to bake Halloween cupcakes on the volunteer Halloween snack sheet because you figured it was easier than making up treat bags for 25 kids? Now you want to impress those little party goers without pulling an 8 hour shift in the kitchen? I am sure no one will be surprised to hear that I LOVE Pinterest. There are so many creative and talented people out there, and we love seeing their creations. I am sure part of it is that we love trying new things and are always looking for fun things to bake. 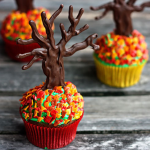 The great deserts on Pinterest inspire us and these adorable cupcakes will get your family into the Halloween spirit in no time and, they are perfect for sharing with all those little ghosts and goblins. 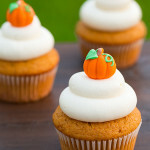 These Pumpkin Cupcakes with Cream Cheese Frosting have got to be added to your fall to do list! Simply put, these cupcakes are seriously delicious! I mean how could you go wrong with a moist pumpkin cupcake that has the perfect balance of fluffiness and density to it, and it’s laced with all those enticing fall spices spices and topped with a decadently divine cream cheese frosting? No one will be able to resist. 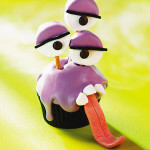 This googly-eyed cupcake will get tongues wagging! Pretzels, marshmallows and candy help this Purple- people eater monster come to life. Why not gross out the kids and whip up some of these slimy cupcakes?! Seriously, these look like so much fun. The kids will loved them – the adults will have a little fun with them too! How frightfully adorable are these little ghosts? Not only are they super cute but they are quick and easy to make as well. 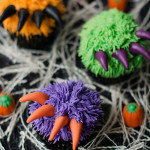 The monsters under the bed have never been cuter than these fuzzy monster cupcakes and are a lot more tame. 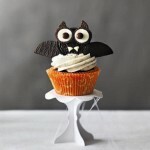 Thrill the kiddies with these creepy cookie bat cupcakes! 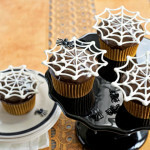 Itsy-bitsy-spiderwebs cupcakes with super-easy white-chocolate toppers appear to float, Houdini-like, over chocolate cupcakes. 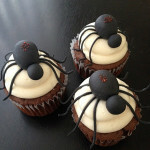 Poisonous spider cupcakes (because that is scarier and grosser than regular spiders) and if we have spiderwebs there must be a spider somewhere…. 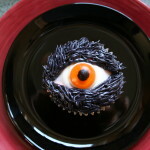 I’ve got my eye on you…okay, maybe not but these eyeball cupcakes are just creepy! These are so easy they are scary! 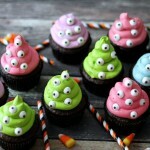 Actually these are one of my favourite monster cupcakes. I thought these cute little witch cupcakes looked darling make sure you don’t forget to download the pattern for the witch shoes found here. I’m not your mummy! 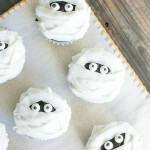 These adorable little mummy cupcakes are perfect if you are running a little low on time and they taste amazing! 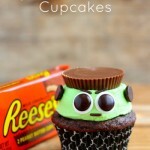 Reese’s Frankenstein Cupcakes make with M&M’s, chocolate chips, sprinkles. green frosting and topped with a Reese’s Peanut Butter Cup for the fabulous head of hair! Did YOU know that white cotton candy happens to look a lot like a spider web? Well well, it absolutely does which makes it a super easy and clever way to make spider web cupcakes for Halloween this year. Here’s one that might take a wee bit more time to make but they are just so dang cute I couldn’t leave this one off my list. And, lets face it, trees at night can be kinda creepy! The trees can be made with any fast-cooling chocolate painted onto waxed paper and then peeled off. Just make sure they’re thick enough, otherwise they might break. 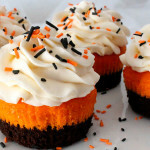 These Brownie Cupcakes are unique, bright, colourful and just screamed “Halloween”. Plus they have sprinkles which we all know is the best part of a cupcake right! For whatever reason, glow-in-the-dark anything is popular with people of all ages. Cupcakes are just as popular — they’re simple and easy to eat and don’t require any cutlery. 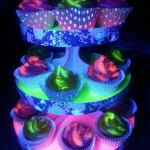 A fine balance between the edible treats and the glowing allure has given birth to an irresistible cupcake that will make adults consume them like children on a sugar high. By nature I am a cat person so where one might see a Howling cat I see a adorable black cat that just wants his chin rubbed. These pumpkins spice pudding cupcakes are the best of both worlds… we all know how much I love pumpkin spice and with the moon and the black cat they are perfect for halloween! Make these cute Jack o’ Lantern cupcakes using canned pumpkin, cake mix and cream cheese frosting for one of the easiest cupcakes on the list. 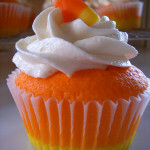 A bit more gentle—but just as sweet—are these easy Candy Corn Cupcakes. Halloween just wouldn’t be Halloween without a nod to our favourite werewolf! 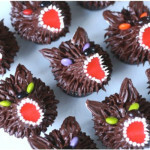 These werewolf cupcakes are worth howling for! Which Halloween Cupcake was your favourite? 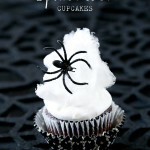 Follow Heather Lawrence’s board Halloween cupcakes on Pinterest. 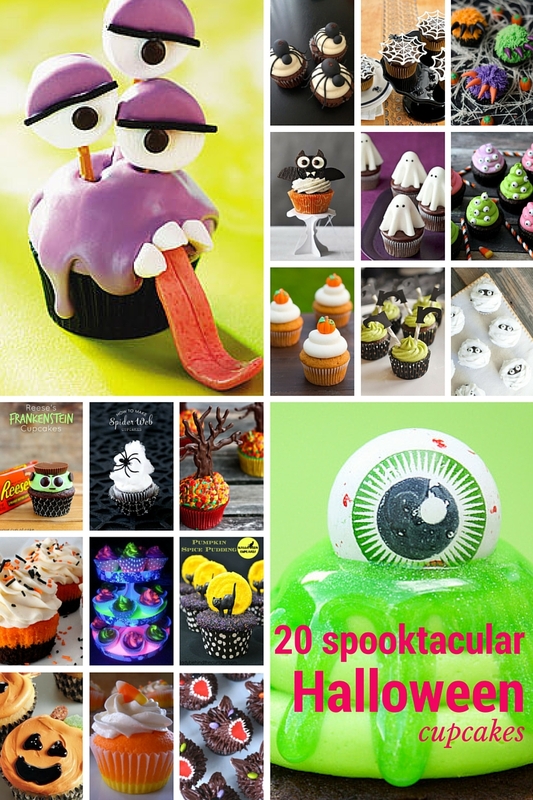 This is an amazing round up of Halloween Cupcakes. I love the eyeball ones, I think my kids would really dig these! These are so creative! I can’t believe these are doable by hand! It would be fun to have some really spooky ones on Halloween. 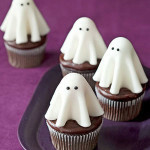 I love the ghost cupcakes – I may just try making them this weekend. These are all fantastic! 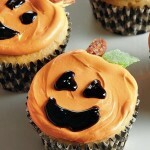 You’ve given me so many ideas for Halloween cupcakes. Those cupcakes are so creative and they all look delicious! Perfect Halloween treats! Can’t wait to make some!! My son is getting older so this year is the first I’ve gone all out for Halloween. He’ll love making cupcakes and these give me some ideas! Yay! Cupcakes are so much fun! I love the decorative aspect and that they are conveniently portioned! 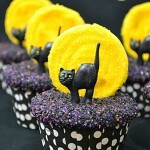 lol The black cat and moon cupcakes are adorable! All great cupcake choices. The eyeballs crack me up and are definitely my fave! Oh great! I have a party to go to this weekend and I’d love to try making one of these! WOW not just one or two but 20 – you must be the hit of all the parties – these sound delish! These are ALL incredible. I get so impressed by the creativity I see around Halloween time. 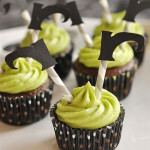 Those Frankenstein cupcakes are too cute. I want to make them all! These are spectacularly fabulous. I am lovely them and now want a cupcake for dessert. These are all such cute cupcake ideas! Now you have me craving some cake. Oh my goodness!!! That purple people eater cupcake is the cutest halloween treat I have ever seen. LOVE IT!!!! And it looks easy. YAY! I want to make a whole bunch of these for my kids. They are all so creative.